Signs A La Carte is a local sign shop that offers high-quality indoor and outdoor signage, as well as vehicle wraps to clients in and around West Chester, PA including Delaware County. 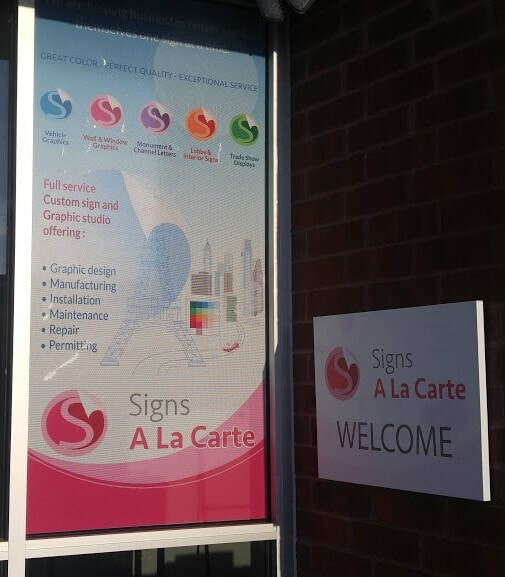 Signs A La Carte offers a specialized service to local clients that is backed by a nationwide network of independent sign companies. This allows us to provide a wide range of product to customers, while responding to our client’s needs in a timely and economical manner. Call Signs A La Carte today at 484.464.0111 for your free consultation with a Signage Expert! Vinyl window graphics are ideal for a temporary or long term storefront business display. They are perfect for showcasing information about your company or simply personalize it with an eye-catching graphic to promote a new product, a sale, or an event on a large area. These custom-made window graphics install quickly and easily, adhering perfectly while you want to keep them up. You can cover your wall entirely or partially with pre-cut vinyl. Call Signs A La Carte today at 484.464.0111 for your free consultation with a Window Graphic Expert! Signs A La Carte offers high-quality indoor and outdoor signage, as well as vehicle wraps to clients in and around West Chester, PA.
Commercial vehicle wraps come in the form of a quality adhesive and advertising sticker that is perfectly resistant to external aggressions (sun, rain, wind ...) as well as intense washing. Our graphic studio can accompany you in the wide choice of lettering, graphics or existing shapes but we can also work on a customization of the visuals you want to print. The more original and striking the lettering of your vehicle in terms of image, the more the eyes of passers-by or other drivers will be attracted. Better will be perceived your identity that can be repeated on all of your vehicles if needed when you deal with fleet management. Call Signs A La Carte today at 484.464.0111 for your free consultation with a Commercial Vehicle Wrap Expert! Do you own a business park, or are you a tenant in a plaza? These types of locations are prime areas for monument sign use. A monument sign can be used to deliver information on what is available within a plaza or complex. Tenants, businesses, offices, and professionals throughout an area with multiples businesses can directly broadcast who they are, and where they are located. Call Signs A La Carte today at 484.464.0111 for your free consultation with a Monument Sign Expert! We make lobby signs in all kinds of styles to suit the tone of your business. If you’re prepared to spend a little more, our brushed metal signs with crisp cut or etched letters will add a distinguished look. How about an etched design on frosted glass? Or we can make painted dimensional lettering and mount onto a metal or plexiglass base. Call Signs A La Carte today at 484.464.0111 for your free consultation with a Lobby Sign Expert! Channel letter signs are very versatile. They work well for everyone from the smallest retailer to the largest big box store. These signs are available in sizes ranging from a few inches to many feet high. This makes them scalable to all areas of a mall. The bigger and brighter the channel letter sign, the more visible it is, so keep that in mind when choosing the design for your business’s location. Call Signs A La Carte today at 484.464.0111 for your free consultation with a Channel Letter Sign Expert! A trade show event is a great place to gain attention from consumers interested in your industry. Utilizing the highest standard of signage for these events will ensure your booth gains notice from attendees, before they visit the competition. Call in our experts to help make this happen. Call Signs A La Carte today at 484.464.0111 for your free consultation with a Trade Show Display Expert!